The NASL leading Carolina Railhawks returned to action after a 10 game break. It was their first game in three weeks back in Cary and the road trip saw them go winless. 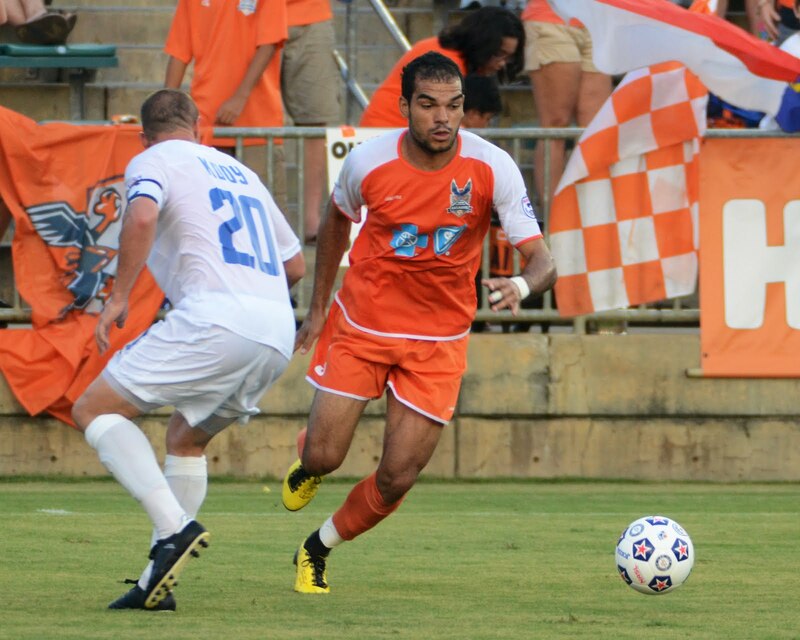 The Railhawks were looking to get back on track and return to their winning ways that saw them go 12-2-2 in the first half of the season. Standing in their way was FC Edmonton who the recently tied 1-1 on July 13th. FC Edmonton has done well this season and entered the match in third place with 25 points and a record of 7-4-5. The game got off to a break neck pace that saw Carolina consistently attack Edmonton’s goal. Matt Watson did particularly well to get in and have a shot, but it went just over the bar. 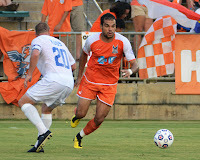 The chances though died down after the first fifteen minutes as the Railhawks no Edmonton could find a consistent rhythm. Edmonton had a good chance in the 26th minute however Brad Knighton stood tall and deflected the shot for a corner kick. Knighton hadn’t been called on to make a legitimate save until then. The heat certainly played a factor throughout the match as it was a scorching 92 degrees and a very high humidity. It clearly wore on the players throughout the match. It was the Carolina fitness that proved true though. “I think we’re one of the most fit teams in the nation…in any league” said coach Martin Rennie. Pablo Compos scored a goal in the 37th minute after putting himself in alone and beat the goalkeeper, Rein Baart one on one. Cory Miller was credited with the assist from near the halfway mark. Just as the teams exited for halftime there was a tussle in the tunnel. We couldn’t see the action however it was reported to be Etienne Barbara and Daniel Antoniuk. This is uncomfirmed but would not be especially surprising considering both have a reputation as being…passionate about their sport. 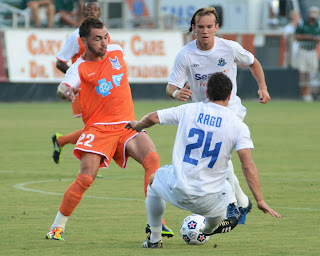 The second half started well for the Railhawks as they looked lively in attack. In the 49th minute Floyd Franks picked up a yellow for shoving an Edmonton midfielder Kyle Yamada. From there the game became increasingly physical. In fact a shoving match erupted in the center of the field after Etienne Barbara was fouled. The two teams converged and shoved and the lone player to receive a yellow out of that was Dominic Oppong. In the 68th minute Carolina increased their lead on a brilliant play from Barbara and Compos. Barbara took the ball out wide and played it into the center where Compos got cheeky and lifted the ball over the keeper and passed the passed the ball into the net. Exceptional work from the former Real Salt Lake forward. Floyd Franks was extremely impressive in the defensive end for Carolina. He could be seen consistently battling for the ball and stripping Edmonton’s offense before they posed any great threat to Brad Knighton’s goal. The Carolina defense seems very comfortable as they are still adapting to the loss of former captain Brad Rusin’s transfer overseas. Carolina’s third goal came from an Edmonton own goal as Pablo Compos again threatened the opposition and sprayed the ball into the box. An Edmonton defender deflected the ball into his own net and the score went to 3-0. It didn’t hold long as Edmonton got one back on a goal from Shaun Saiko and an assist from Daniel Antoniuk. The embarrassment of a shutout was gone for Edmonton but Carolina wasn’t done. Brian Farber found Etienne Barbara in the 87th minute and Barbara made no mistake in blasting the ball past Edmonton’s keeper. The score went to 4-1.